Information on MWIA regional and international meetings related to women´s health you can find here. Save the dates! 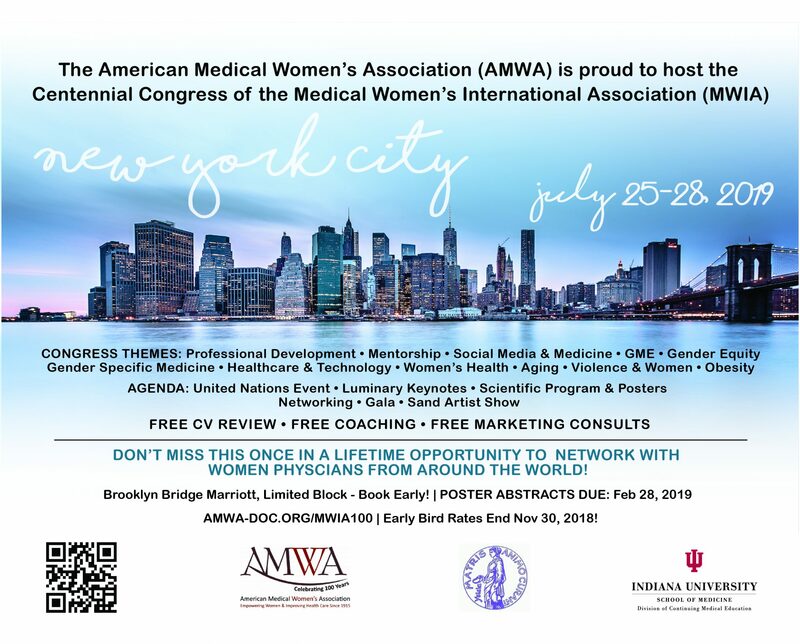 Please mark your calendars now for the MWIA Centennial Congress to be held in New York July 25-28, 2019, where we will continue to celebrate women in medicine! In the first section which provides information about the Congress, there are a number of time-limited opportunities that may interest you. In the following sections, there are requests of particular interest to the National Coordinators and Presidents of each National Association to provide their information that will then appear in the Congress Report as a permanent record. This information needs to be with the Secretariat at secretariat(add)mwia.net by April 1st at the latest. Please take time to note these deadlines. MWIA is looking forward to seeing you in New York City! A total of 247 participants from 12 countries and regions worldwide attended the Western Pacific Regional Conference 2017 in Hong Kong on 25-27 August 2017. This was a well organized conference with inspiring talks and great networking opportunities. 3 resolutions were drafted and will be submitted to Ethics and Resolution Committee. The Australian Federation of Medical Women (AFMW) will nominate the incoming Vice President of MWIA (Western Pacific Region) and the result will be announced by Dec 2017. Korea Medical Women Association (KMWA) will organize the next Regional Conference; Philippines Medical Women Association (PMWA) will host a Regional Business Meeting in Cebu to further discuss the governance and collaborations among the various national associations in the region. The Great Hall of the British Medical Association in London was the venue for the main conference, entitled 100 Years of Medical Women Past Present and Future. It was a day full of excellent speakers on topics covering all eras and speaking of a bright future for women in medicine as we move into the next 100 years. MWIA president Bettina Pfleiderer and MWF president Parveen Kumar (to her right) were cutting the centenial cake (photo to the left). A detailed report can be found here! The MWIA Latin American Regional Conference was Held in Sao Paulo from 4 – 7 March 2015 (see pics here). Delegates from 5 countries were present: Mexico with 11 , Peru 12 , Panama with 8 , Ecuador with 9 and Brazil with approximately 40 participants. These topics were presented at the roundtable: gender differences, empowerment of women, violence against women and a study of mental health in Brazil calling attention to the high suicide rate and drug addiction of physicians. The next Regional Conference will be held in Panama in March 2017 and will be organized by President Elect Dr. Gysella Padilla. The AMWI celebrated The International Women’s Day on 7th March 2015 in Mumbai with an interesting Programme. The President of AMWI, Dr. Arati Basu Sengupta came from Kolkata to deliver the 1st Dr. Usha Saraiya Presidential Oration. The subject wa s “Domestic Violence” which is the theme of this MWIA triennium. Also present on the occasion was Dr. Bhupinder Sandhu, Past President UK Medical Women’s Federation (MWF) UK who delivered the Shirin Mehtaji Guest Lecture (see Photo; to the right is Dr. Usha Saraja, MWIA Vice-president Central Asia) .The theme of the programme was “Today is our day to make a difference to the life of women worldwide”. MWIA was represented by the Philippine Medical Women’s Association led by Dr. Perla Dolera, current president of the Philippine Medical Women’s Association, and Dr. Rosa Maria H. Nancho, PMWA representative to the MWIA. MWIA congratulates the Korean Medical Women´s Association for organizing such outstanding 29th International MWIA congress in Seoul entiteld “Medical Women Advance Global Health” that has just ended. Over the course of four days more than 1100 attendants discussed many issues facing medical women today. Pictures of the congress will be available on the congress website soon. The abstract book of the 29th International Congress of MWIA in Seol (31 July -3 August ) can be downloaded here. Each region is represented on the Executive Committee by its Vice-President. Each Vice-President is encouraged to organize a regional meeting of the National Associations and Individual Members of her region between International Congresses. These scientific meetings consider issues of importance to the region.